My boss and I have frequent arguments discussions about the definition of Art. He believes that a painted piece of wood is Art, and I disagree. This is the same person who frequents museums on a very regular basis, but will avoid the Balenciaga and Yves St. Laurent exhibits right down the hall because he can’t be bothered. Well, I certainly think that a gown that required hundreds and hundreds of hours of work by skilled artisans deserves of spot in a museum (and deserves to be worn as well!). So what makes a piece of Art worthy of a museum? Webster defines Art as “the quality, production, expression, or realm of what is beautiful or of more than ordinary significance.” How exactly did a splash of paint or some kind of ink scrawl become classified as “Art” and why are some people willing to pay thousands and thousands of dollars for something that looks like a small child could easily create and seems, to me, to be the definition of ordinary? 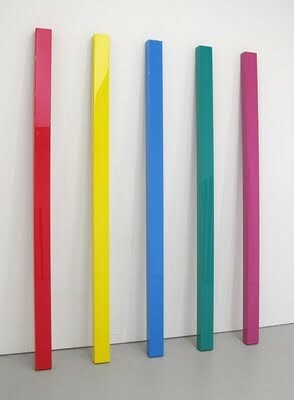 So when my boss first mentioned an artist that painted planks of wood and had a successful career, I was skeptical, and then rather infuriated. If this is art, then every house painter out there deserves to be in a museum, right? How is his creation any more special than a stick that a small child took a paint brush to? As you may have guessed, I am not a huge fan of modern art. What I find amusing is that the clothing and silhouettes I gravitate toward were most likely inspired by this very work. But hey, at least I can see the hypocrisy, right? I adore Elsa Schiaparelli, but have a hard time with Salvador Dali – ridiculous, I know, but since when does personal taste follow any sort of logic?! That being said, I can certainly appreciate the skill involved in some of the art created in the last century. And I love when clothing designers like Yves St. Laurent are inspired by a flat canvas created by Mondrian and make a woman’s curved shape into a canvas of shape, color, and blank space. Brilliant! With my recent introduction to John McCracken (he of the painted plank) fresh in my mind, I came across the Sew Weekly’s “Inspired by Art” Challenge. 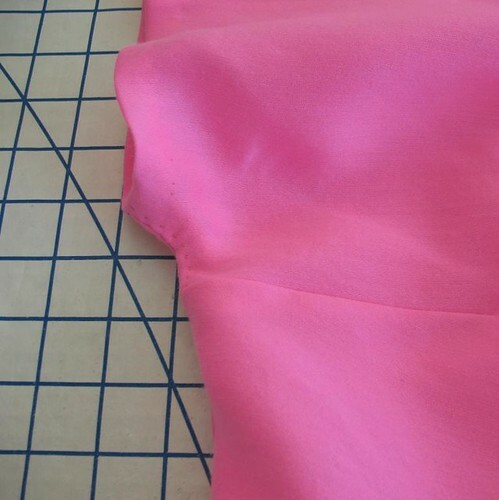 I happened to have a bright pink wool/silk blend fabric that has been calling out to me. Add to that a recent ebay purchase of this pattern, and I knew exactly what I wanted to make up. This dress is really very simple in construction. 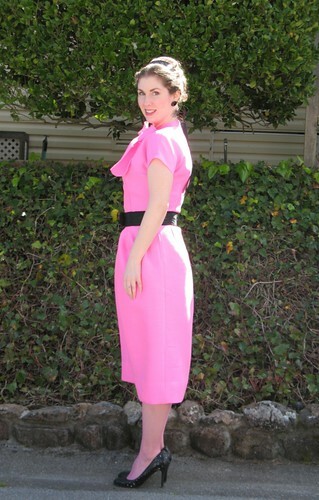 The thing that makes it interesting for me it the pleating on the front of the skirt and, of course, the bow! Kimono sleeves are fabulous, but I am always nervous clipping the seams. 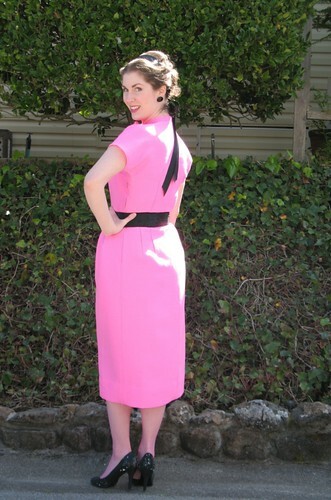 I came across a little trick in the instructions for this dress years ago and have found it really helps: topstitching on either side of the curved seam for a couple of inches directly over where you have clipped will keep those cuts from migrating into and beyond the seam. I generally machine stitch this technique, but this time around I decided to hand back-stitch for added control. Speaking of hand stitching, I am really becoming obsessed with lapped zippers. 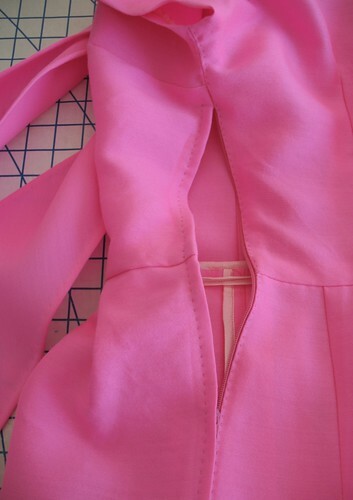 And although the fabric might not have needed it, I added a strip of organza to stabilize the zipper – I think it also helps keep the seam from pulling the loose weave open during wear. Of course, halfway through the project I was convinced that the fabric was NOT working for the silhouette. Imagine the body of silk organza with the added thickness of wool. It really is fantastic stuff (and another one of my Fashion Fabrics Club purchases that was an unexpected color – I really wonder who is taking those photos!) but I was afraid that I was going to look like giant pink balloon. 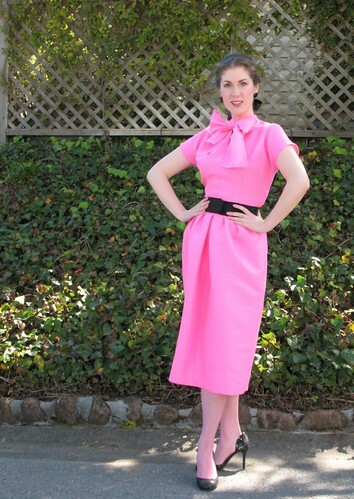 This dress can stand up on its own without a dress form or body to hold it up! 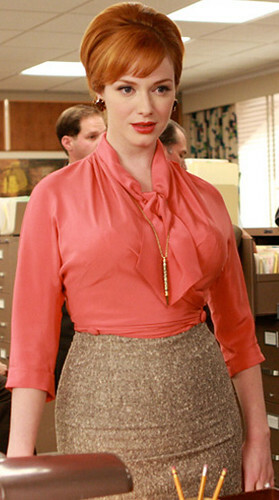 Now that the dress is complete, it really looks more Mad Men than plank to me, and perhaps that is a good thing. 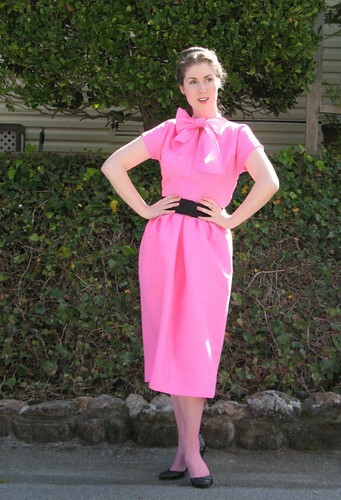 Joan, in particular, can’t seem to get enough of bright pink. And if it’s good enough for her, it's certainly good enough for me! Enough of my rant - and perhaps that is the true purpose of Art - to spark discussion and thought. "Not ONE word about the B330." "Mmm hmmm. I fully expected to be seeing red, but she knew that." "So she diluted the assault with titanium white." "Ya know, the anagram for 'mentioned lilac' is 'indolent malice'!" "Ya don't say? Guess there's more in a name than I realized." "Or a tortured form of truth in advertising." "Suddenly it's all about the fabric, modern art, what others value, and balloons." "Don't forget the showcased hand stitching." [scoff] "The few visible machine stitches stink out loud of a Bernina's handiwork." "Flawless, yet NO credit given. Who'd of thunk she'd stoop to that?" "Suddenly I detest your jest." [wounded inhale] "So, is she a piece of art, or a piece of work?" "Neither, she's our sewing nemesis, and it's clear that she knows us better than we know ourselves." [in unison, with arms crossed] "THAT Laura Mae!" That was "Overheard conversation #15", for those keeping track at home. Oh Laura this is so gorgeous - I love it on you! The pink especially. Not normally a colour I'd aim for, but you pull it off with absolute aplomb. The black belt is a perfect match. Stunning! I love the dress and thanks for the story of how it came to be! 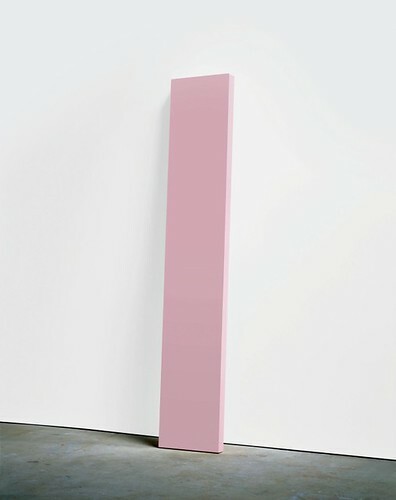 I think modern art needs a different approach to appreciate it. Modern art is (often) less about skill and more about concept. And you need a good presentation/marketing skills, that way you can have anything in a museum, I guess. i would much rather look at a gallery full of your gorgeous dresses than one full of painted planks! Oh-so pretty! 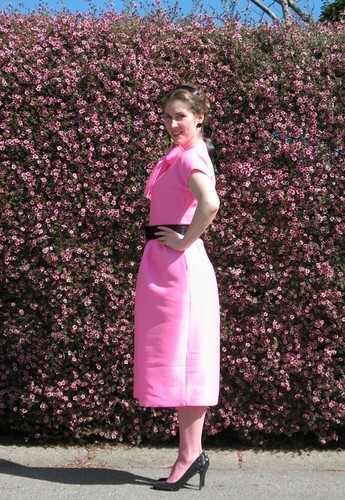 That shot of the perfect pink dress in front of the blooming hedges is just lovely! 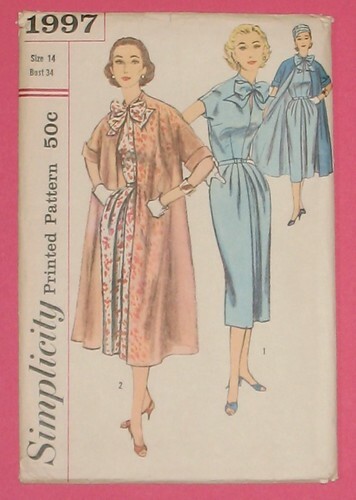 I always love your versions of the vintage patterns.